Last December, Lauren was struck by a vehicle and killed in Lexington, Ky., hours after competing with her GRC teammates in the National Club Cross Country Championships, her first cross country race. But her 5K memorial run Sunday, organized by her GRC teammates and well attended by Lauren’s family and friends, was clear proof that her spirit lives on. All proceeds from Lauren’s Run will benefit an organization that supports Cades Cove, a valley in the Great Smoky Mountains where Lauren spent many summers hiking and camping with her family. Jack and Sharon traveled from their home near Knoxville, Tenn., to take part in the event. They were joined by their son, Nicholas, a graduate student at UCLA, Jack’s brother, and family friends. Through college and law school, Lauren’s passion for equestrian sports became more difficult to maintain. She started running recreationally, gradually re-applying her dedication to equestrian sports into distance running. In 2009, she ran her first marathon, qualifying for Boston. In early 2012, Alexander observed Lauren doing a workout one night at Bethesda Chevy-Chase High School, where the club practices, and invited her to join the team. In one of her last races, Lauren raced head-to-head at the Navy Air-Force Half Marathon with an Olympic trials qualifier, nearly breaking her personal best for 5k along the way. 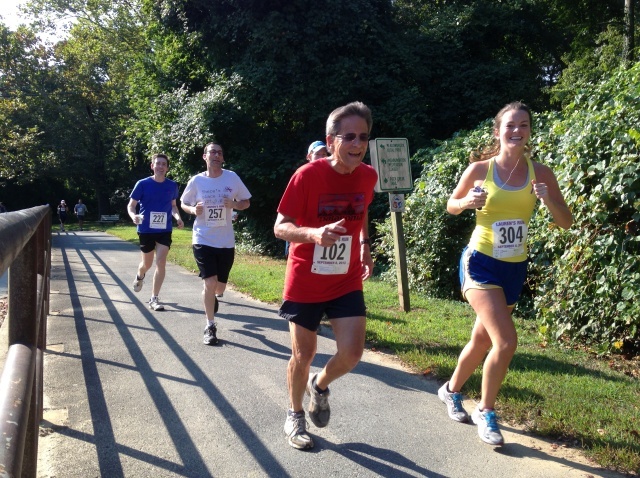 This 5k, really, was about bringing people together. When Lauren’s husband Peter Roady, a budding triathlete, told friends about the event and they in turn told him they “weren’t really runners,” Roady told them, “It’s not really about running a race. It’s about being outside, being active” – celebrating the essence of Lauren’s dedication to the sport. His good friend, Anand Prakash, who does not think of himself as a runner, was convinced to run and walk the course the day after returning from a work trip to Bangladesh. While James Pagano of Arlington was top male in 17:14 and Michelle Miller of Damascus was top female in 20:12, participants also walked and pushed strollers. Before and after, participants and GRC members who helped put on the event gathered around the Meadowbrook Park Activity Building’s picnic tables – near the start and finish – to socialize and share memories over baked goods supplied by club members. GRC’s Lindsay Donaldson O’Brien, Laura O’Hara, and Patrick Murphy chose to stage Lauren’s Run where they did because it was near the park’s horse stables, which the route passed twice as it looped through park roads and bike paths. Roady, who was joined at the event by his parents, sister, extended family, friends, and co-workers, added that the race’s location was Lauren’s favorite place to run. They lived near the park and often ran the trails together. Lauren also liked to do long marathon training runs on Beach Drive, Peter said. Four years ago, Lauren inspired Peter’s mother, Celia, to start running. She completed a 5K, and has been running four or five days a week ever since. Weeks ago, at 62, she completed her first triathlon. For Rockville’s Jeff Lynch, Lauren’s Run was his first 5k in 28 years, when he was in high school. He was one among several dozen of Lauren’s co-workers at the Nuclear Regulatory Commission who participated in the event – walking, running, getting across the finish line. Lynch and other NRC employees had learned of Lauren’s running accomplishments through an article in the agency’s newspaper. Lynch was joined in the event by co-workers he meets at the end of the day to workout in the NRC gym, where Lauren used to sneak in a second workout on her lunch breaks. “Maybe I’ll have to start running more,” he said.